In 1983 Bono sang “Nothing changes on New Year’s Day” and he was quite right. The passing of one year and the start of the next doesn’t change anything, but it does give an excellent opportunity to reflect on the past 12 months and make a plan for moving forward. The start of a New Year is the perfect time to take stock of your mobile DJ career and make plans for the coming months. To help with this, we’ve got a few articles in this edition about reflecting on the past and planning for the future. 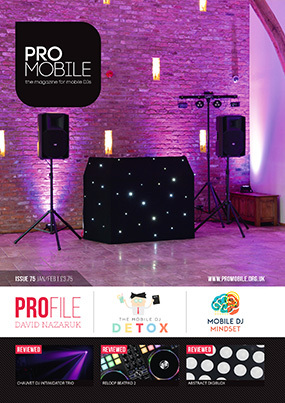 David Reed asks, “Is Your Goal to Have a Better Year in 2016?”, while ‘The Mobile DJ Detox’ applies the principles of the popular ‘January Detox’ health kick to the mobile DJ business. Of course there is also the usual mixture of mobile-DJ related articles, news, reviews and opinions - happy reading! National Wedding Industry Award winner David Nazaruk shares his story, from playing as a child in Ukrainian folk bands, through teaching music, to running a leading mobile DJ business. The top 10 pieces of mobile DJ equipment from the past year, as voted for by mobile DJs on our website. Reinvigorate yourself and your business with a New Year’s health-kick designed for DJs! Eddie Short shares ideas for putting together an effective mobile light show as well as making the most of the gear you already have. Stephen J Elliot offers advice for preparing yourself mentally to give your best performance every time. Is Your Goal to Have a Better Year in 2016? Advice from David Reed on evaluating your current situation and positioning yourself for a successful year. The annual Pro Mobile Conference is coming up at the end of February, time to start planning your trip! Mobile DJ industry pioneer Roger Squire recounts another tale from DJ history: this time his experiences of the legendary Citronic twin deck consoles. 'Ian D' Smith draws useful lessons from his experiences as a dance producer and remixer in the 90s and applies the lessons he learnt to the modern mobile DJ industry. In the latest instalment of his regular article series, Richard Linton discusses New Year's Eve and the value of a mobile DJ business. Radio pioneer and DMC founder Tony Prince talks about the inspiration behind, and process of creating, his new online documentary series 'History of DJ'. Brian Mole, David Nazaruk, David Reed, Eddie Short, Greg Cartwright, Ian Forest, Ian Smith, James Humphrey, Mark Walsh, Richard Linton, Roger Squire, Stephen J Elliot and Stu McLaren.